About that time Herod the king laid violent hands upon some who belonged to the church. He killed James the brother of John . . . and . . . he proceeded to arrest Peter also. . . . And when he had seized him, he put him in prison. |(The Acts of the Apostles 12:1-4)|Rembrandt’s painting shows the apostle Peter in his prison cell in Jerusalem following his arrest. A shaft of soft, golden light falls on him from an unseen source, leaving large parts of the painting in total obscurity. The saint’s attribute is clearly visible, however: two large metal keys signifying the keys to the kingdom of Heaven bestowed on him by Jesus, which in this situation suggest the irony of his jailed state.|St. 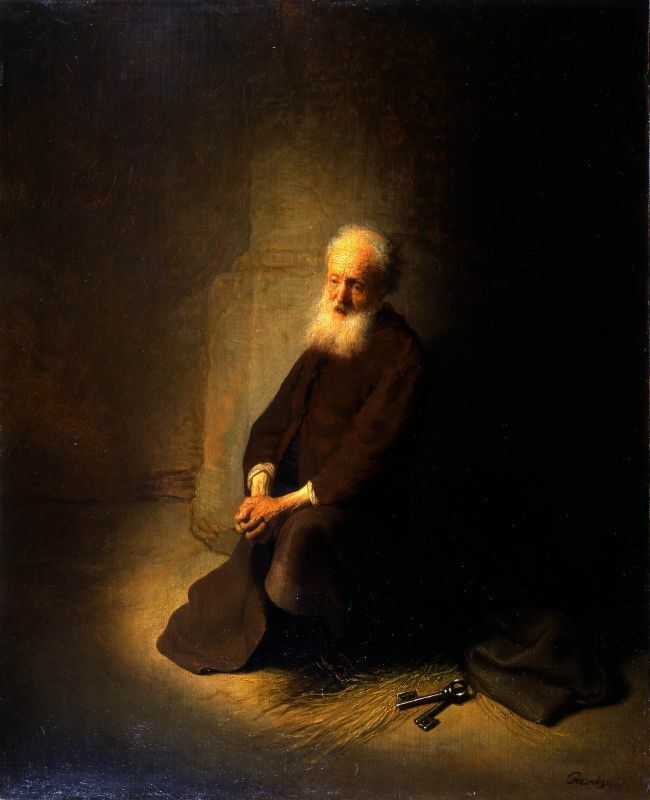 Peter kneels, his gnarled hands (the hands of the fisherman he once was) clasped in prayer but also in despair, his lined face expressing an old man’s desolation. He cannot know that the Angel of God - perhaps foreshadowed in the mysterious source of light - will soon appear to bring about his miraculous escape. The simple humanity of Peter is emphasized, and yet the radiance that encircles his face like a kind of halo conveys his sanctity. This different interpretation of a familiar subject exemplifies Rembrandt’s genius at portraying states of mind and spiritual qualities through the language of light and shadow.